Posted by Cora Hall on January 24, 2019 in Hockey, Sports. Corey Mackin, senior forward and captain of the ice hockey team, has been nominated for this year’s prestigious Hobey Baker award. The award is given annually to the top player in college hockey and is something Mackin said he has always aspired to. “I mean, growing up I always wanted to be a Division I hockey player and obviously I knew the Hobey Baker was basically the most prestigious award in college hockey, so I was pretty excited when I saw my name on the list,” Mackin said. Players are nominated by their coaching staff and athletic department and the criteria for being nominated include displaying character on and off the ice, contributing to the integrity of the team, exhibiting outstanding skills and academic achievement. Ferris hockey head coach Bob Daniels spoke highly of Mackin’s character and community involvement and said whenever there is an opportunity to volunteer, whether it’s for Special Olympics or to read at elementary schools, he’s the first to step up. Ferris Athletic Director Perk Weisenburger said that being the top point scorer and team captain made Mackin an obvious choice for a nomination. “He is an exemplary young man and someone we obviously place a great deal of trust in when it comes to leadership in the locker room, on the ice and in his role as team captain,” Weisenburger said. A large part of Mackin’s game and leadership mentality is a positive attitude and keeping the rest of his teammates motivated. According to Weisenburger, Mackin is on track to pass 100 career points and is the team’s active career leading scorer with 40 goals, 53 assists and 93 points. 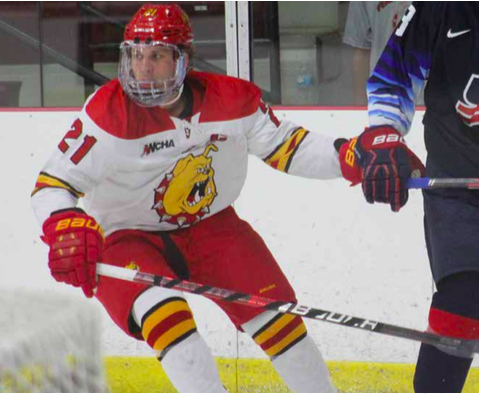 Mackin joined rare company when he passed the 40 career goal mark and is the only Bulldog to do so since 2010. The Hobey Baker Award was named after hockey player and World War I veteran Hobey Baker, who was recognized as the best amateur player in the U.S. in his time and was the ultimate gentleman sportsman, according to the Hobey Baker website. The award started in 1981 and 81 Division I players from 46 schools have been nominated this year for the accolade. Fans are able to vote for all players until March 10, after which the top ten will be chosen and fans can vote for them from March 20 to March 31. Three finalists will be chosen by April 4 and the winner will be announced during the NCAA Frozen Four Championship on April 12. The last Bulldog to make the top ten finalists was CJ Motte during the 2014-15 season. Mackin said he’s grateful to everyone who votes and his family, who have been his biggest promoters thus far. “Just thank you to everyone that’s voting right now. I know my mom, my dad, my brother and my two sisters, they’re getting pretty crazy on Facebook right now trying to get everyone to vote so I just want to thank them and just thank the community for voting for me,” Mackin said. For those who wish to vote, visit www.hobeybaker.com.